The Russian airline Aeroflot has found an unusual use for its Sukhoi Superjet 100 (SSJ-100). Having received official carrier status with the English soccer club Manchester United (MU), according to an Aeroflot representative, the airline now plans to exhibit one of its aircraft near Old Trafford stadium—the home arena of the legendary team. "The decision is not final, but there is a preliminary agreement with the English side," he said. "The plane, of course, will be painted in Aeroflot colors." 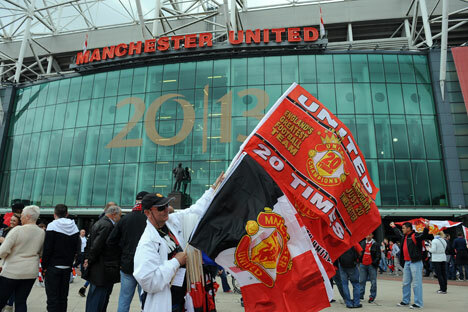 Manchester United has tens of millions of fans around the world, making it very attractive to advertisers. The company has about two dozen sponsors in various categories and regions. In the 2011/2012 financial year, the club received over $94 million in sponsorships—15 percent more than the previous year. When the Superjet 100 was purchased from Sukhoi Civilian Aircraft, the catalog price of one jetliner with the basic configuration was $26–27 million. For a new, fully equipped Sukhoi Superjet-100, Aeroflot has to pay the WEB-Leasing company approximately $165,000 per month, according to the airline's information. Thus, Aeroflot will have to pay about $2 million a year to be able to exhibit its own aircraft in Manchester. The fans will not be able to ignore the Superjet: Old Trafford holds nearly 76,000 people, and almost all Manchester United home games are sold out. In addition, hundreds of thousands of tourists from all over the world visit the stadium each year. The five-year contract between Aeroflot and MU is set to go into effect on July 1, 2013. The amount of the deal was not disclosed. Under the contract, Aeroflot will be able to use the Manchester United logo in its advertising and marketing campaigns; the fleet will even gain an aircraft with the Manchester United logo. The airline will also use images of the players in its advertising, as, for example, Turkish Airlines has done as the official carrier of MU for the past few years. However, according to the company's press release, Aeroflot will not act as an actual carrier for MU. It will "provide MU with professional organization and strategic advice regarding transporting the team and club representatives" and, "as appropriate," provide charter flights. Aeroflot is the first Russian company that Manchester United has signed a contract with at the club level. However, former "daughter" company Vimpelcom in Southeast Asia remains a partner of MU in Vietnam, Cambodia and Laos.